MOSCOW, Russia -- An enormous Russian convoy of about 280 trucks carrying so called humanitarian aid has left Moscow for southeastern Ukraine, Russian television and news agencies reported Tuesday. The Russian aid has been an object of suspicion for Ukraine and its Western allies, who accuse the Kremlin of trying to use it as a stealth method to invade its smaller neighbor with armed forces to support the besieged separatists in Donetsk and Luhansk. But President Vladimir V. Putin and other senior Russian officials all insisted on Monday that it was a peaceful convoy coordinated with the International Committee of the Red Cross. Television pictures showed a long line of tractor-trailers stretched along a road. A Russian Orthodox priest was shown sprinkling the trucks with holy water before their departure. Many of the vehicles were draped in huge banners reading “humanitarian aid” in Russian, along with the double-headed eagle of Russia and its white, blue and red flag. The convoy was carrying 2,000 tons of humanitarian aid, according to the news agency Itar-Tass. It included 400 tons of cereals, 100 tons of sugar, 62 tons of baby food, 54 tons of medical equipment and medicine, 12,000 sleeping bags and 69 generators of various sizes, the agency reported. Talking about the convoy on Monday, Sergey V. Lavrov, the Russian foreign minister, said he hoped the humanitarian effort by Russia would not be blocked by Kiev or by its Western allies. The Russian government began a concerted effort to get the convoy accepted on Monday, setting off alarm bells in the West despite the Kremlin’s insistence that it was coordinating its efforts with the Red Cross. The secretary general of NATO, Anders Fogh Rasmussen, has estimated that there is a “high probability” that Russia will intervene militarily in Ukraine, and Ukraine has announced that even more Russian troops than previously thought are massed along the border. But Russian officials repeatedly insisted that the convoy was to provide relief, particularly to the besieged, separatist-held city of Luhansk, where residents have been without water and electricity for days. Putin on Monday called the president of the European Commission, José Manuel Barroso, to tell him that the convoy was being dispatched. Mr. Barroso responded by warning “against any unilateral military actions in Ukraine, under any pretext, including humanitarian,” the European Union said in a statement. 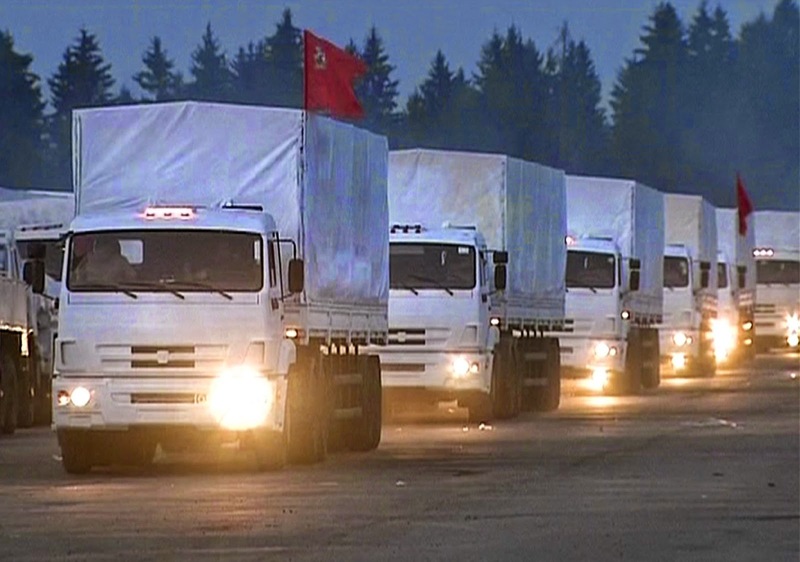 The Ukrainian government approved the aid convoy, but only if delivered under the auspices of the Red Cross. The office of President Petro O. Poroshenko issued a statement saying that he had spoken on Monday with President Obama, who also welcomed the decision to allow humanitarian aid under Red Cross auspices into the city of Luhansk. A spokesman for the Red Cross said the logistical details for the convoy’s entry into Ukraine had yet to be worked out. “A general agreement exists but not a detailed plan,” said Andre Loersch, the spokesman, speaking by telephone from Kiev. The general agreement calls for the Russian Federation to hand over humanitarian aid, which will then be distributed by the Red Cross. Mr. Poroshenko has consulted twice by telephone in recent days with Peter Maurer, the head of the International Committee of the Red Cross, on the agreement, he said. In Kiev, the former Ukrainian president, Leonid Kuchma, who has served as a mediator between the government and the rebels, said the aid would be distributed to hospitals, kindergartens, orphanages and other people in need. “The militants must not receive one gram,” he was quoted as saying by the news agency Interfax. The Russian aid convoy would cross into Ukraine near Kharkiv, he said, and would then drive to Luhansk. Along with the Red Cross, representatives of the Organization for Security and Cooperation in Europe, which has also been part of the mediation effort, would accompany the convoy to Luhansk, Mr. Kuchma said. The convoy evoked suspicion and anger from some Ukrainian politicians on Tuesday. At a morning session of Parliament, called the Rada, Oleh Lyashko, a nationalist politician who has helped form several paramilitary battalions, called for Ukraine to turn back the convoy and seal the border. “How can you take humanitarian aid from a country that destroys our country?” Mr. Lyashko said. Parliament was also due to vote on imposing economic and legal sanctions against 172 Russian, Ukrainian and other foreign nationals. The Red Cross said that many details regarding the Russian aid convoy remained to be worked out, including security guarantees. “The practical details of this operation need to be clarified before this initiative can move forward,” Laurent Corbaz, the group’s head of operations for Europe and Central Asia, said in a statement. The Red Cross stressed that it never accepts armed escorts. “Very intensive work is being carried out,” said Dmitri S. Peskov, the Russian presidential spokesman, according to Russian news agencies. Once the details were worked out, the aid would be delivered immediately because of the “tragic humanitarian situation” in Luhansk and Donetsk, he said. There has been speculation for months over whether Russia wanted to intervene directly in the conflict next door. Most analysts concluded that it did not, figuring that the costs of what would amount to an occupation would be too high in soldiers’ lives and in financial terms, especially in the face of sweeping Western sanctions. But as the area controlled by the separatists has gradually shrunk to the two cities of Luhansk and Donetsk, the question has focused on what Putin would do to assure continued influence over events in Ukraine. Kiev and the West accuse Moscow of sending men and weapons to the area, a charge the Kremlin has denied. There is little doubt that Russia possesses the capacity to carry out an invasion of southeastern Ukraine. NATO has said in the past that Russia had deployed about 20,000 troops along the border. On Monday, however, a Ukrainian military spokesman, Colonel Andriy Lysenko, said the numbers had risen alarmingly, to around 45,000 troops, supported by 160 tanks, 1,360 armored vehicles, 390 artillery systems, 150 truck-mounted ground-to-ground rocket launchers, 192 fighter jets and 137 helicopters. Those figures could not be independently verified. The headquarters for Ukraine’s “antiterrorism operation,” as the military campaign in the east is officially known, said Tuesday that military raids had destroyed three rebel checkpoints. Shelling continued in the Donetsk and Luhansk regions late Monday evening and early Tuesday morning. In Donetsk, the City Council said that shelling had damaged the electricity infrastructure, leaving 206 substations without power. Quote: "«Как президент Украинской национальной ассоциации, обращаюсь к вам с просьбой принять необходимые меры по решению сложившейся ситуации, включая применение законных санкций к стороне, нарушившей регламенты и игнорирующей базовые принципы высших футбольных инстанций. Наша позиция относительно клубов и коллективных членов, расположенных на территории полуострова Крым, остается неизменной и принципиальной. Это вопрос всего украинского футбола. Крым - является частью Украины, поэтому все футбольные субъекты Крыма находятся под юрисдикцией Федерации футбола Украины», - отметил он." Above is one of the example and consequences of unlawful annexation of Crimean peninsula. Below is the quotation describing participation of Ukrainian military units in what is a part of the Crimean war. Later Russia tsarist government stopped to specify the origin of the military units, and called every one Russian soldiers. My stepfather has common Russian last name but he is a 100% Jewish, how is it relevant to Crimean war or its annexation? Family of my stepfather kept as their inheritance the story of why and how they got the Russian name. Story goes like that: "During the time of Peter I new recruiting system was introduced. That system envision that every male in the family who has more than one male would be drafted for 25 years, excluding the first born. So, to protect one of their son from being drafted stepfather's ancestors signed up one of their sons to the Russian neighbor who had no son. This events happened in Ukraine, in the city of Bila Tserkva near Kiev. The point is that Russians claim Crimea because their soldiers fought for it. Well as we all know that soldiers are drafted from all over in the Empire, and like all Empires they prefer do draft from the pulls of other nations in the Empire first and then their own. So, perhaps there are as much Ukrainians died per capita for Crimea as Russians, and that is not counting the times of Kiev Russ' when soldiers from Kiev would attack Byzantine empire forces in Crimea at the ancient city of Khersones on a regular basis. My point for all this writings is that annexation of Crimea is clearly a land gathering of Russian Empire. If that is allowed to go on unpunished Russia may begging claiming all the territories of its ex-Empire such as Finland, most of Poland, Alaska and who knows what. Crimea must continue to be a part of modern Ukraine. Quote from Wikipedia: "Another Russian army (120,000 men, mostly cavalrymen, Streltsy, Ukrainian Cossacks and Kalmyks) under the command of Boris Sheremetev set out for the lower reaches of the Dnieper to take the Ottoman forts there. On May 27, the Russian fleet (2 ship-of-the-lines, 4 fire ships, 23 galleys etc., built at Voronezh and nearby locations) under the command of Lefort reached the sea and blocked Azov. On June 14, the Turkish fleet (23 ships with 4,000 men) appeared at the mouth of the Don. However, it left after having lost 2 ships in combat. After massive bombardment from land and sea and seizure of the external rampart of the fortress by the Ukrainian and Don Cossaks on July 17, the Azov garrison surrendered on July 19."